NOAA & Others Cooking The Books To Fit The Political Narrative. What happens when the political narrative (Global Climate Change/Global Warming) that you are promoting does not pan out? There has not been a catastrophic rise in the sea levels nor has the Polar Ice Caps melted away because of Global Warming. The planet has failed to burn up as has been predicted. So NOAA, the IPCC, and the UN Climate propagandists are cooking the books. They are changing raw historical climate data worldwide by raising the observed temperature averages to fit their narrative. As hard as it is to believe it is true. Listed below are some of the recent headlines and news stories on this very controversial subject. The Recent Global Surface Warming Hiatus. "A new study published online today in the journal Science finds that the rate of global warming during the last 15 years has been as fast as or faster than that seen during the latter half of the 20th century. The study refutes the notion that there has been a slowdown or “hiatus” in the rate of global warming in recent years." UN Official Exposes The Intentional "Transformation Of The World Economy" As The True Purpose Of The Climate Change Lies. "The purpose for this huge man-made global warming lie was exposed outright by the quote above from Figueres. The global community has put all their eggs into the climate change basket as their launch for a "tranformation of the world economy," and rather than sacrificing those eggs they are pushing the lies even harder." Another Model - Verses - Reality Problem - National Weather Offices: Canada, A Case Study With National And Global Implications. "It is time for skeptics in every nation to openly challenge what is going on in their national weather offices. It is occurring in some countries, but a greater effort is required. It’s time for skeptics of every nation to look at what is going on in their weather office. There is something seriously wrong when they can publish completely failed results with impunity and yet still demand credibility over policy. Skeptics need to expose how the bureaucracies are used for a political agenda and do it with inadequate data and corrupted science." Climate Scientists Criticize Climate Paper (Karl et al.2015) That Erase Pause In Warming. "Until last week, government data on climate change indicated that the Earth has warmed over the last century, but that the warming slowed dramatically and even stopped at points over the last 17 years.But a paper released May 28 by researchers at the National Oceanic and Atmospheric Administration has readjusted the data in a way that makes the reduction in warming disappear, indicating a steady increase in temperature instead. But the study’s readjusted data conflict with many other climate measurements, including data taken by satellites, and some climate scientists aren’t buying the new claim." 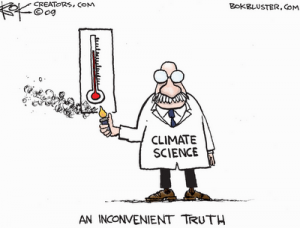 Global Warming: The Theory That Predicts Nothing And Explains Everything. "A lot of us having been pointing out one of the big problems with the global warming theory: a long plateau in global temperatures since about 1998. Most significantly, this leveling off was not predicted by the theory, and observed temperatures have been below the lowest end of the range predicted by all of the computerized climate models.So what to do if your theory doesn’t fit the data? Why, change the data, of course! Hence a blockbuster new report: a new analysis of temperature data since 1998 “adjusts” the numbers and magically finds that there was no plateau after all. The warming just continued." Meanwhile The Sun Continues To Fall Into Its Deep Slumber. 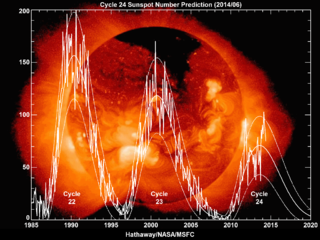 "Solar Cycle 24 is the 24th solar cycle since 1755, when extensive recording of solar sunspot activity began. It is the current solar cycle, and began on January 4, 2008, but there was minimal activity until early 2010. It is on track to be the Solar Cycle with the lowest recorded sunspot activity since accurate records began in 1750." While the world's politicians scamper to and fro to scare the masses into believing that we are destroying our planet with carbon emissions and are the root cause of Climate Change/Global Warming...the Sun, the real driver of the planets climate continues to slowly fall asleep. There are many indications that instead of Global Warming we are facing another "Little Ice Age" as the sunspot activity diminishes, and the world's oceans cool with time. Yet this is seldom if ever talked about in the mainstream media because it totally contradicts the Climate Change Agenda of the Left. My wife and I went and saw the movie "San Andreas" yesterday. I loved it. But consider the possibilities of what will happen to California when this does in fact happen! Consider the implications of an increase in global earthquake and volcanic activity due to the changes ongoing with the sun. Not everyone agrees with this but it is worth considering. Earthquake And Volcano Threat For The US Increases. In a rare letter to Mr. Craig Fugate, the Administrator of the Federal Emergency Management Agency (FEMA), the Space and Science Research Corporation (SSRC), has disclosed that we are about to enter a potentially catastrophic period of record earthquakes and volcanic eruptions throughout the United States. The letter was signed by SSRC President, Mr. John Casey, and delivered to FEMA headquarters in Washington, D.C. today. In the letter, Mr. Casey outlines how the ongoing dramatic reduction in the Sun's energy output will not only plunge the world into a decades-long cold epoch, but at the same time bring record geophysical devastation in monster earthquakes and volcanic eruptions. These cold climate periods called "solar hibernations" or "solar minimums," are well known phenomena in the solar physics community. The SSRC has done important pioneering work in the field of solar- climate modeling and has established itself as a leader in climate prediction and the study of these hibernations of the Sun. Citing new research included in the SSRC's semi-annual Global Climate Status Report (GCSR) to come out on Wednesday, the letter to FEMA's Craig Fugate contained an important warning for all major earthquake fault zones and volcanically active areas. The research focuses especially on the increased threat for the New Madrid Seismic Zone (NMSZ) between St. Louis and Memphis. This new threat information is contained in one of several papers in the June 10 edition of the GCSR paper authored by Mr. Casey and Dr. Dong Choi, Director of Research for the International Earthquake and Volcano Prediction Center (IEVPC). The paper shows that the NMSZ is due for another calamitous quake between 2017 and 2038. Dr. Choi and Casey show that for four times in a row since the year 1450, a major quake strikes the NMSZ when the Sun has gone into a hibernation phase. This scientific revelation is what Choi and Casey believes solves the puzzle of when the next major quake will strike the area. Geologists have studied the NMSZ for many years using traditional approaches. Casey and Choi say it is the combined research from the fields of solar physics and geology that provides the best opportunity to date to estimate when the next devastating NMSZ earthquake will strike. Other scientists agree with their opinion. For this singular reason Dr. Choi and Mr. Casey have strongly recommended to FEMA Administrator Fugate that all high risk earthquake fault zones and areas with a history of volcanic eruptions in the USA take immediate precautions to mitigate what they describe as a "period of unparalleled geophysical lethality and destruction." Mr. Casey adds, "The very strong correlation between these solar minimums and the incidence of catastrophic earthquakes worldwide is an impressive display of how interconnected we all are to our natural world and the cycles of the Sun. It would be foolhardy to ignore in particular, the history of major earthquakes in the NMSZ and the fact that at the bottom of every solar hibernation for the past 600 years, that area has seen devastating earthquakes ranging from M6.8 to M8.0. "While we address the New Madrid risk in this press release and in the June 10, 2016 Global Climate Status Report, the coincidence of major earthquakes with solar minimums is not limited to just that area of the US. That is why our letter to Administrator Fugate was a nationwide alert. The ~M9.0 Cascadia quake and tsunami of 1700 was at the bottom of the coldest solar hibernation period which was called the Maunder Minimum. The Great San Francisco quake of 1906 was at the bottom of another solar low point - the ‘Centennial' Minimum as it is called at the SSRC. This strong association of solar activity and the worst earthquakes and volcanic eruptions could represent the ‘missing link' for geophysical disaster prediction." Dr. Choi (Australia) also supports Casey's opinion by saying, "The extensive research done in this area is clear in its implications. When the solar minimums arrive, the worst recorded earthquakes and volcanic eruptions strike. The last solar minimum for example, saw the largest series of earthquakes in human history in the NMSZ and the largest recorded volcanic eruption at Mt. Tambora in Indonesia. These events occurred within a few years of each other during the coldest period in the Sun's last hibernation in the early 1800's."